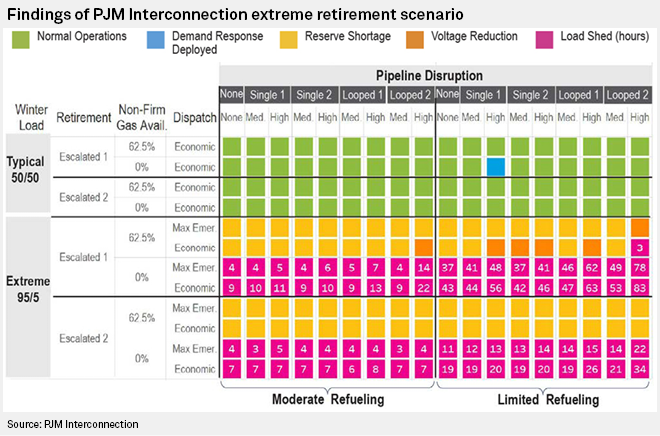 The PJM Interconnection has found that its system can handle expected generation retirements, but problems could arise in five or so years under some extreme scenarios, including the rapid and mass closure of coal-fired and nuclear plants combined with fuel supply issues and extreme weather events. A summary of the report — the grid operator expects to issue the complete study in December — said the system can withstand an extended period of stress while remaining reliable and fuel secure in most circumstances, PJM CEO and President Andy Ott noted during a Nov. 1 press briefing in Washington, D.C. But looking about five years out to 2023, a stress test using two levels of rapid plant retirements indicated that under extremely rare, but what Ott said are plausible, scenarios a rapid closure of nuclear and coal-fired units combined with a winter cold snap and fuel supply shortages could trigger up to 83 hours of load shedding. PJM manages the high-voltage transmission system and related power market in 13 mid-Atlantic and Midwestern states plus the District of Columbia. "When combined with the extreme winter load both (retirement scenarios) indicated similar results," PJM Vice President of Operations Michael Bryson said. "The system may be at risk for voltage reduction — which is an emergency procedure to conserve load — and in some cases, lost load or power outages." PJM's findings in many ways echo a draft report the North American Electric Reliability Corp. circulated at one of its committee meetings in September. The draft report, which S&P Global Market Intelligence obtained, warned the accelerated retirement of coal and nuclear power plants over the next several years could lead to power outages, temporary shortfalls in surplus generation and transmission problems in several regions. Largely due to their inability to remain competitive in the face of cheaper natural gas-fired and renewable generation, U.S. coal and nuclear generators are closing in large numbers and the nation's energy mix is undergoing a major shift away from those fuels. But that trend has raised concerns about whether the system can handle such a rapid change and additional incentives are needed to keep more plants from retiring. At issue is whether the ability of some types of generators to store fuel on-site provides a level of reliability that renewables and gas-fired projects cannot offer and whether the markets or other mechanisms should provide additional financial incentives for that fuel security. The Trump administration, particularly the U.S. Department of Energy, has proposed and is said to be mulling additional options for propping up financially ailing coal and nuclear generation in the name of resilience. Owners of the struggling nuclear and coal generation projects have pled for federal and state intervention, arguing that their projects can supply a degree of reliability that gas and renewables projects cannot. And the Federal Energy Regulatory Commission is reviewing the state of grid resilience after rejecting DOE's proposal to ensure full cost recovery to generators that can store fuel on-site for 90 days. The PJM report and draft NERC report offer more alarmist sounding views than they have in the past and Ott acknowledged in the briefing that he has come under pressure from a number of interested parties, including some state governors, to determine under what circumstances the grid could reach the tipping point and face reliability problems tied to coal and nuclear retirements. A NERC official in March said that with the right policies and infrastructure, the U.S. could get most of its electricity from renewable resources without hurting grid performance. In the briefing, PJM's Ott reiterated his belief that the wholesale markets can be tweaked to solve any generation-retirement, fuel mix or reliability-related concerns. "We feel strongly that as we look forward, solutions to any dependency or any risk that we see is best done through defining it as an attribute in the market," Ott said. "We think government intervention is unnecessary, I've been on the record saying that. It would be inefficiency and more costly and a market-based solution would be best." The problem, said Ott, is that nuclear and coal-fired plants have attributes that are not currently valued in the market. "There are generators who replenish their fuel supplies during the winter, but the only way to get paid for it is through capacity performance. My message would be I think there are legitimate concerns and questions about resource attributes that are not priced, which led to conversations about interrupting retirements through market mechanisms," Ott said. Ott told reporters after the briefing that PJM announced the report's findings before publishing the full document in order to start the discussion and to allow PJM to modify the report based on issues and questions that may be raised by interested parties. The grid operator aims to work with stakeholders in 2019 on finding a solution and potentially propose something to FERC in 2020, Ott and Bryson said. Two pro-renewable energy organizations said they are pleased PJM wants to create a market-based solution but the groups criticized the grid operator's focus on resource attributes rather than performance. "A more comprehensive study would have recognized how renewable energy technologies provide a range of resiliency and reliability attributes to the grid, including flexibility, dispatchability, and other essential reliability services," Todd Foley, ACORE senior vice president of policy and government affairs, said in a statement. American Wind Energy Association Senior Vice President for Government and Public Affairs Amy Farrell in a statement said PJM "should not presuppose a fuel supply solution when other options such as transmission enhancements exist. PJM should focus on valuing grid services that keep the lights on, letting any and all technologies compete to provide those services in the market. This will give consumers what they really care about, a reliable and resilient electricity supply at the lowest possible cost."